My Husband Next Door Opening Line: The first time I knew I was in any sort of trouble was this time last year, when I ran out of church, disastrous flowers in my hands, straight into Ludo. This is a love story, of a husband and a wife, their lovers and what it takes to make a marriage work. Ella and Sebastian need to work their way through the tumbled arrangement of their marriage, and how love is defined. Intertwined with their love affair is the trials and tribulations of Ella’s parents’ marriage, her sister’s relationship and the odd people who find themselves being a part of Ella’s life. I normally do not stop reading a book half way through, but with this book I did. We went overseas when I was mid way through this book and when we came back, I was mid way through another book. I only read a chapter a night so it should have taken me less than a month to read. The nice thing was I picked up this book after a 3 week break and immediately fell back into it. 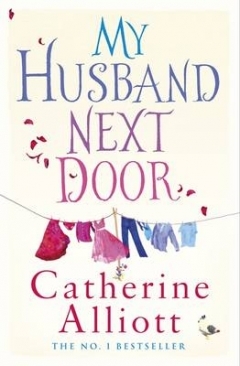 Catherine Alliott writes well and the rhythm of this book is fantastic. It is an easy read and I will look out for more of her books. I am on leave until the 6th of January and will reply to blog comments then. I am sure you will enjoy this one Rachel! I was looking for a good read. Thank you. I’m always reading a new book so thanks for this suggestion!